What I did for "love"
Another of the interesting Church buildings that appears during television coverage of the Olympics in Torino is the Chiesa della Gran Madre di Dio ("Church of the Great Mother of God"). Ostensibly, the church honors Mary, the mother of our Lord Jesus Christ. Architecturally, the 19th century neo-classicist building honors ancient Rome’s Pantheon. 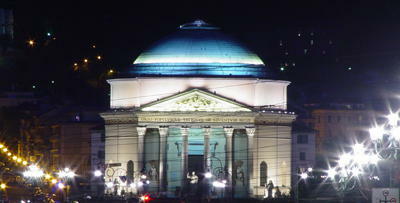 Historically, the building was built to celebrate the House of Savoy’s return to power in Torino after the Congress of Vienna dismantled the Napoleonic empire.